Author’s Note: If you’re planning to read the episodes themselves for the first time, you may want to skip this page. There are tons of SPOILERS here! Upon the commissioning of the ninth ship in a series of Enterprises, a newcomer joined the ranks of Starfleet captains and took command of the Enterprise-G. Neil Cross is respected among some but is not without opposition among the admiralty. Cross suffered trauma at an early age, when he was taken prisoner by the Jem’Hadar during the Dominion War. He joined Starfleet as soon as he could and was a model officer. He married a Bajoran doctor, Elris Lea, also in Starfleet, and though their marriage was happy for a time, it fell apart due to the death of their child. Cross entered a depression but has since begun moving on. He is now Captain of the Enterprise, Starfleet’s advanced flagship, and commands a diverse crew. 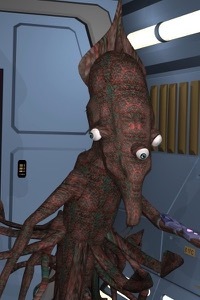 By virtue of his command, he is also one of the most important diplomats for the Federation because he is often on the front lines and can move quickly to any front. This comes with considerable power, as seen when he decided to withhold aid from Cardassia just a few weeks after being assigned to the Enterprise; later, he hosted a meeting between the Klingon government and Klingon rebels. Cross has carried out dozens of missions since taking command, including many along the Klingon border. However, he does not always stick to Federation policy, following his heart and his belief in older Starfleet values. During the Coular Incident he took on a visitor, the Q’tami anthropologist Y’lan; the decision was held up during the following hearing. When Starfleet attempted to place marines on the Enterprise, Cross refused and it nearly ruined the career of one Admiral Henry Portman. The Enterprise was nevertheless assigned to the Klingon border, but Cross demonstrated considerable audacity when he aided Klingon refugees, skirting the law. Needless to say, Captain Cross is unpopular with many of the top brass at Starfleet, but there have always been a few old-timers who respect him, such as the late Admiral Portman, his mentor. His crew represents a diversity of viewpoints, from a Romulan exchange officer the aforementioned Q’tami scientist. Following in the tradition of previous Enterprise captains, Cross remains somewhat aloof from his crew. 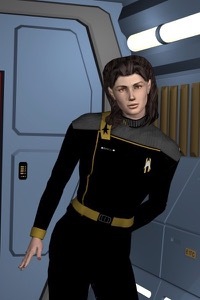 He is forming a professional relationship with his first officer, Commander Talora, and works regularly with his senior staff, but outside of that, he remains introverted. Matters are complicated by the presence of Doctor Elris Lea, his ex-wife with whom he has struggled to form a solid rapport. 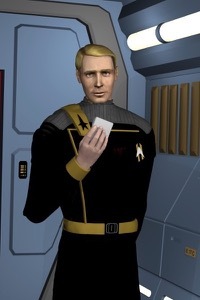 Until Admiral Portman’s death in late 2401, he was Cross’s closest confidant and biggest supporter at Starfleet Command. Cross was first officer to Portman at Marcus Base during the Sheliak War. Addendum by Admiral Delfune:Captain Cross has been reprimanded for going against Federation and Starfleet policy in the aiding of people aboard a ship being pursued by Klingon law enforcement. This reprimand was issued on Stardate 78822.5. 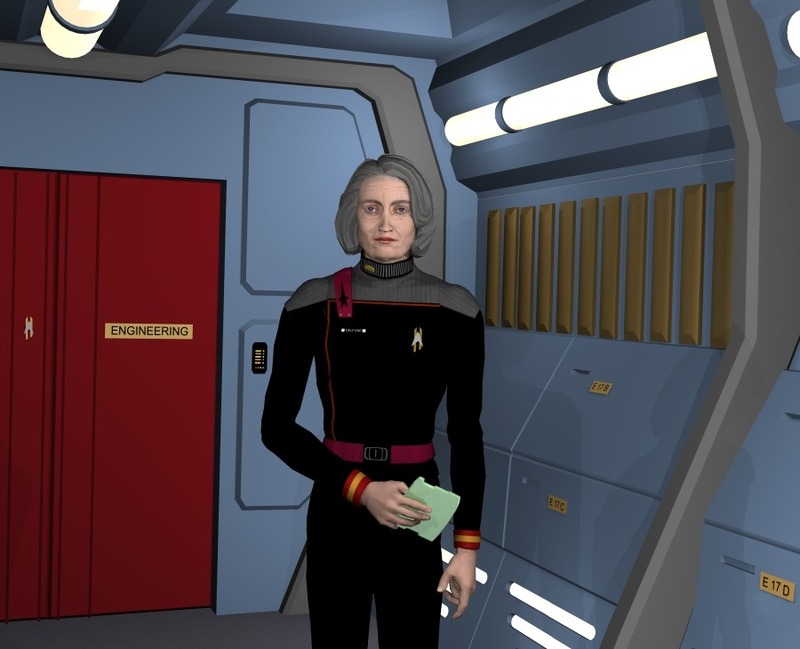 Commander Talora is the latest of at least a dozen Romulan officers to go into an officer exchange program with Starfleet. She has come in with some doubts about the professionalism of Starfleet officers but with commendable curiosity and alacrity. Before she joined Starfleet, Talora rose through the ranks to become a Subcommander in the Romulan fleet. She graduated third from her class at the Academy and received numerous commendations for wartime service. She was picked for the program for her fine record and also because she exemplifies the character of a Romulan officer. 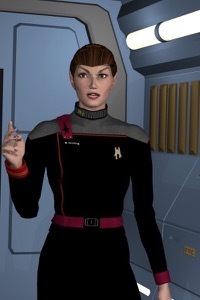 Talora received a commission as Commander and was the first Romulan officer to attain such a high rank in Starfleet. As First Officer to Captain Cross, she has shown herself to be capable and adaptable. Although she originally met much resistance among the crew - particularly Jennifer Quinlan - she began to adapt. Commander Talora instantly picked up on the finer points of Starfleet, successfully representing her new captain at a hearing on Stardate 78080.4. She has also demonstrated loyalty to Cross when she aided him in negotiations with Romulans over several disputed worlds. When she and Quinlan were trapped on a pirate shuttle some months later, the two began to form a working, if still antagonistic, relationship. Commander Talora has done the same with other crew, and may inspire some loyalty herself. 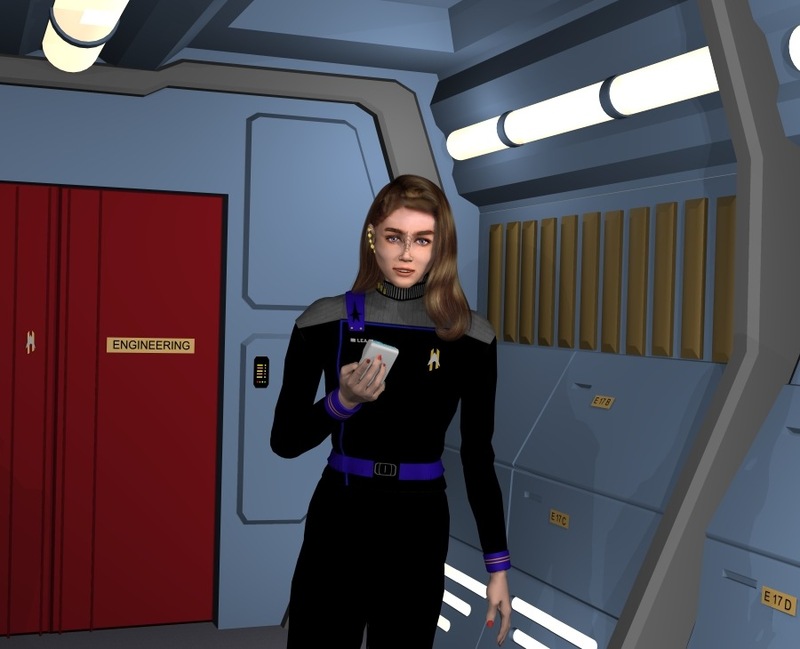 Finally, she has begun to recognize the core of Starfleet officers, strong character; even her antagonist and tormentor Jennifer Quinlan was awarded a promotion to chief CONN officer. Commander Talora has formed a few friendships among the crew, including one with fellow loner Lieutenant Dojar. She and Captain Cross are forming a strong working relationship, although she must often remind him of his greater responsibilities when personal issues take hold. However, her cold nature and intense professional attitude inhibit most closer bonds; for example, she and the oft-rebellious Lieutenant Quinlan have agreed to dislike each other and keep it at that. 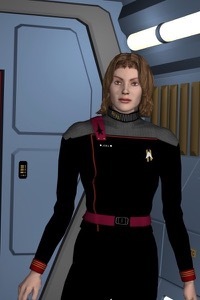 Although she claims to be primarily a medical researcher, Doctor Elris Lea has done an excellent job as the Enterprise’s chief medical officer. Elris was deep into research when Captain and estranged husband Neil Cross asked her to join his crew as chief doctor. Although she had initial doubts about leaving her work, she realized that she could continue her research on the fleet’s most advanced starship. Doctor Elris has proved her skill as a physician several times during various emergencies. She also has a good bedside manner and can often connect with patients, as she did with Michael Kavanagh, who she was treating for rectoneurial acceleration. However, she has been known to let her personal life interfere with her work. The prime example of this is the events of 78412.9, when her husband was under her care. She and Neil Cross were separated at the time, but when he was injured by Anticans, emotions and past experiences inhibited her ability to be objective. She has not, however, limited herself to the operating table. Elris is strong in her convictions if not her faith, and is willing to stand up for what she believes in. When a shuttle carrying two Enterprise crew was lost, she pressed Cross to disobey orders and join the search. 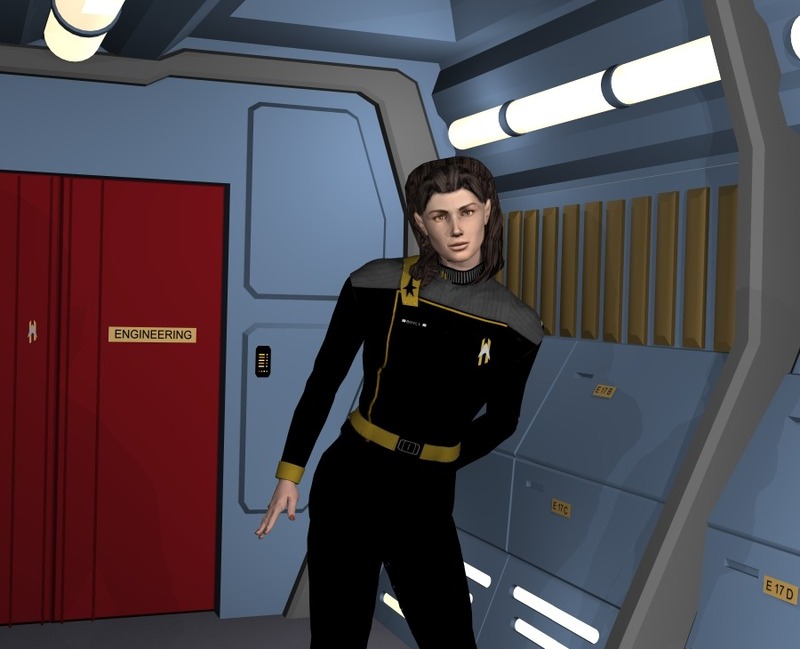 She is still adjusting to the significance of her position; as a Bajoran in a high position, she is a role model to the younger, lower-ranking Bajorans on the ship. When not on duty, Doctor Elris often fraternizes with fellow members of the Senior Staff. She and Gril Dojar are becoming good friends, and though Jennifer Quinlan enjoys sticking her nose into Elris’s business, the two are becoming close companions. However, Elris has had a rocky relationship with ex-husband Neil Cross. Over their first year on the Enterprise, they struggled to cement a professional relationship and put their past behind them. She eventually divorced him in the hopes that that would enable them to form a working rapport. 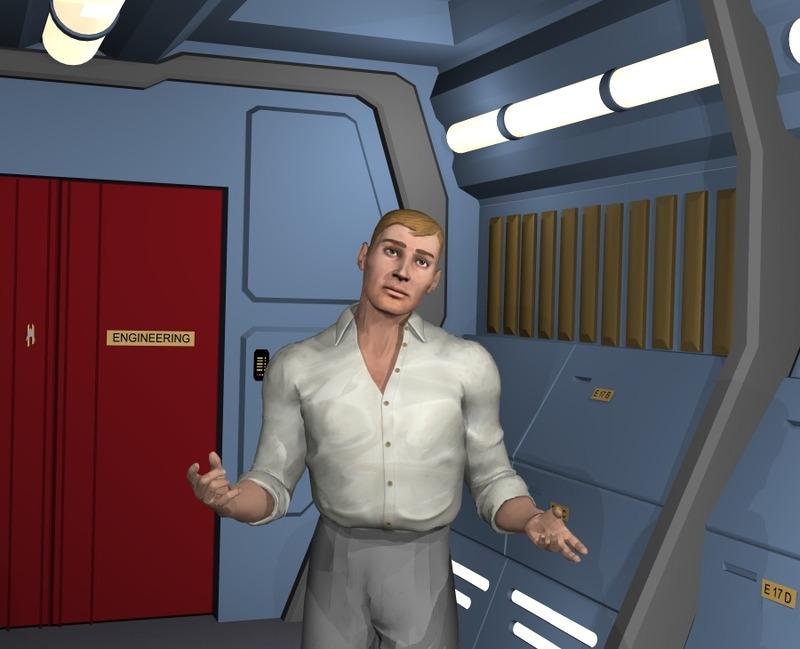 Lieutenant Grey brings together his military background and his engineering expertise to create a unique command style on the most advanced engine room in Starfleet. He runs a tight department on an otherwise liberal ship, and he requires the highest degree of efficiency and perfection from his staff. 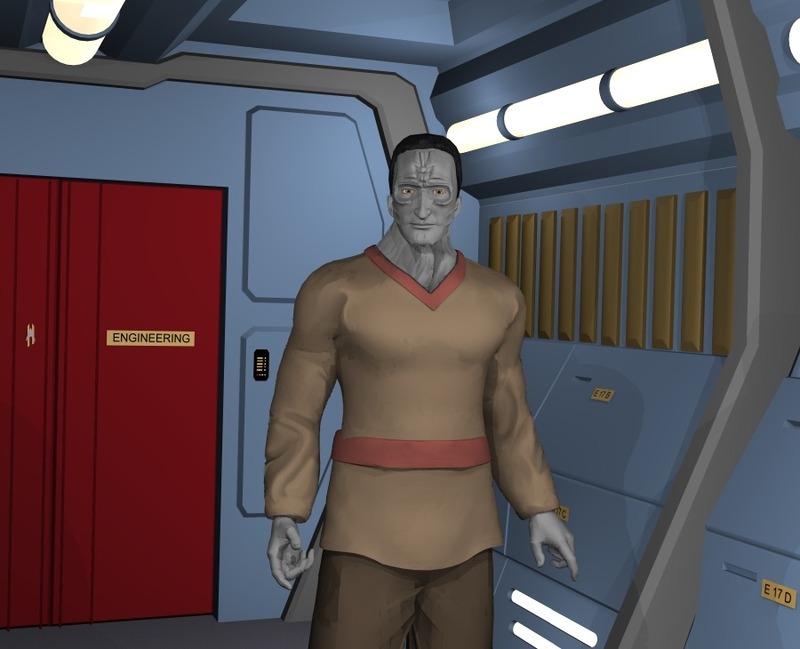 Grey started his career in the Starfleet Marines, spending most of his time as an executive officer. He was awarded medals on many occasions, but his technical skills in engineering led him to Starfleet. He quickly was made chief engineer of the USS Enterprise, where he currently serves. The ship’s delicate systems would sometimes prove problematic, but Grey soon found that greater challenges lay in the liberal structure of Starfleet and the political currents not present in the Marines. On one occasion, his shuttle was attacked and he was forced to rely on his wits rather than the manual. Later, on Stardate 78783.6, he found himself opposing the effort to put Marines on the Enterprise. The constant struggles of the Enterprise crew often affect the ship itself, and that is when Grey’s job is most important. He has found, however, that the guide book is not much help in this regard. Unfortunately, Grey has never been known for his creativity, and it has often been the imaginative solutions of those around him that he must implement. For example, during the Enterprise’s maiden voyage, Captain Cross came up with a way to jumpstart the Enterprise’s frazzled engines. Nevertheless, Lieutenant Grey is ever expanding his horizons, and in this respect he is a model officer. Grey’s by-the-book attitude has affected his social life negatively, but he is working around that. Grey is cultivating a relationship with Lieutenant Boyle, although they argue from time to time. In addition, ever since they were stranded in a shuttle together, Grey has been fast friends with Chief Ozran, the senior transporter technician. The idealistic engineer has also found a mentor in Captain Cross, and the two often share views. Finally, Grey is casual friends with Lieutenant Dojar, the tactical officer. Lieutenant Dojar is truly one-of-a-kind. He is one of the first Cardassians to join Starfleet and the first to attain a truly important position. He is crucial to Starfleet’s security, responsible for security on the Enterprise-G, which is packed with the latest in technology. Dojar has proved valuable in many ways. 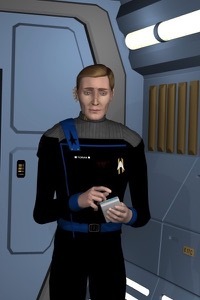 His service on the flagship began with the discovery, along with Captain Neil Cross, of a century-old crashed Q’tami shuttle during the Coular incident on Stardate 78020.5. 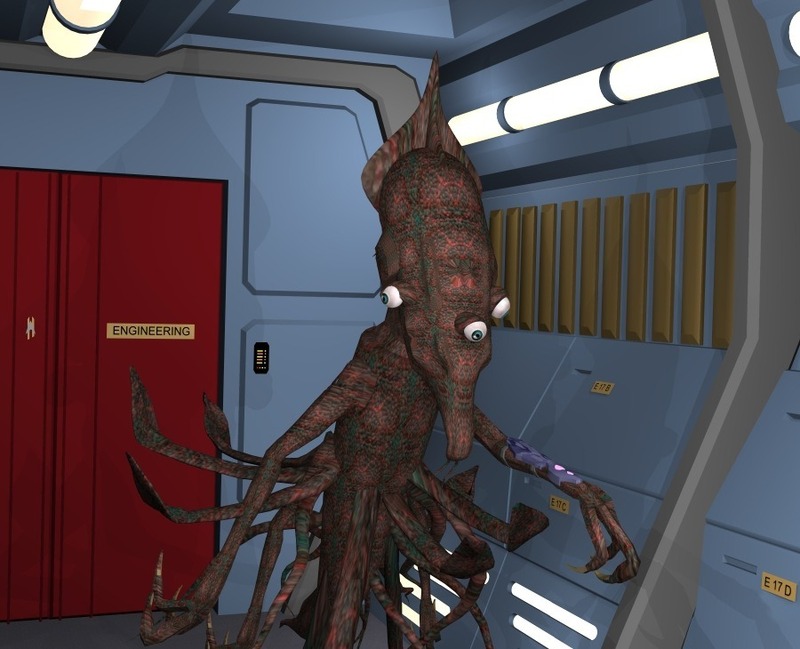 When he was trapped in the McKeggan Wormhole a few weeks later, he and Commander Talora had the realization that the wormhole was kept stable by life-forms; the realization allowed their escape and return to the Enterprise. Several months later, he led the mission that resulted in first contact with the inhabitants of a planet clouded in radiation. However, Lieutenant Dojar’s profile cannot be limited to scientific discoveries. Although he is surrounded by aliens, Dojar’s Cardassian heritage is strong within him. When the Enterprise visited his homeworld on a humanitarian mission, he argued to Captain Cross that the Cardassian people needed the precious aid. Later, on Stardate 78457.4, Dojar was captured by Bajoran terrorists seeking revenge. He remained proud of Cardassia and refused to let terrorists take that pride away. 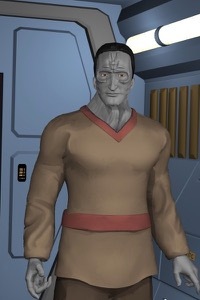 Dojar also proved to be adept at law, another Cardassian characteristic, when he defended then-Crewman Jennifer Quinlan when she was convicted of theft. When he is not exploring wormholes or arguing on behalf of his people, he spends time with several friends among the crew. Lieutenant Dojar felt some initial isolation aboard the Enterprise, but has since become friends with Commander Talora and Lieutenant Grey. He also enjoys the occasional lunch with Doctor Elris. His relationship with Captain Cross, however, was muddied by the latter’s slight prejudice against Cardassians and the decision to withdraw humanitarian aid. Jennifer Quinlan may not seem like the ideal choice for the flagship’s senior pilot, but she has time and time again proven her skill and resourcefulness. Although her career has been rocky, she may finally be finding her place in Starfleet. She entered Starfleet shortly after the end of the Dominion War and rose to the rank of Commander. She was assigned to the USS Nightingale as First Officer. However, when the ship was surveying a black hole in the Argolis cluster, the ship was accidentally caught in the gravitational pull of the black hole. Unable to escape, Commander Quinlan ordered separation. When the stardrive and the saucer were apart, she ordered the destruction of the stardrive, producing an explosion great enough to propel the survivors to safety. Quinlan was court-martialed but resigned from Starfleet. She procured a small ship and turned pirate, living on her own for several years. When she was captured by the Enterprise just prior to the Coular Incident, Quinlan was offered an ultimatum by Captain Cross: stay on as tactical advisor or face prison time. She decided to stay on the Enterprise and for several months served as a consultant on various matters, taking on the role of “gossip officer” in her spare time. Her conduct was less than exemplary, partly because Quinlan often succumbs to the effects of alcohol; however, when she was sober, she was valuable. When Talora embarked on a probe retrieval mission into space populated by pirates, Quinlan accompanied her and her expertise saved both lives when they were captured. Later, Quinlan and a former friend helped rescue Lieutenant Dojar when he was abducted by Bajoran terrorists. Several weeks later, Quinlan applied for the position of CONN Officer and won a commission as Lieutenant, Junior Grade. 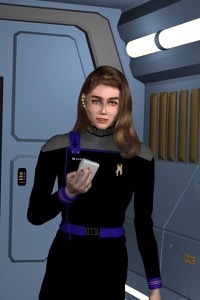 Quinlan originally found herself with little to do aboard the Enterprise and took on the role of “gossip officer.” She kept herself abreast of all the latest rumors and at the same time made friends and enemies. She and Doctor Elris are finding common ground in their dislike for Captain Cross. Quinlan and Talora, initially taking every opportunity to argue with one another, agreed to disagree, they continue to torment each other from time to time. Y’lan is the sole envoy of the Q’tami to the Federation and thus almost fully represents what the Federation knows about this mysterious race. The Q’tami do not reproduce sexually; however, for purposes of transition, Y’lan is referred to as male. He was found on Stardate 78020.5 by Captain Neil Cross and Lieutenant Gril Dojar, both of the USS Enterprise. Y’lan was in stasis in a crashed vessel. After a truce with the orbiting and very much active Q’tami vessel, Y’lan was brought on board as a diplomatic attache. He remains on the Enterprise, conducting tests and research in the science lab he has appropriated. Results are transmitted telepathically from the lab to the Q’tami government, the Hegemony. Although he has occasionally brought a new point of view to staff meetings, Y’lan is usually more concerned with Q’tami matters. His position on the Enterprise is often hazardous, and more than once the flagship has been caught in the middle of Q’tami political strife. Y’lan refuses to divulge much information about the enigmatic Hegemony or the group of rebellious Q’tami called the Faction. Nevertheless, he has been kept on board for his occasional help with advanced searches and his insight into Q’tami matters. Note: These bios are written from the perspective of Starfleet administrative and command personnel. However, Y’lan proves an exceptional case because of his secretive nature. The reader should know that Y’lan learned of a ‘time differential’ between him and the Hegemony in the first-season episode "Faction Protocols". What he transmits to the Hegemony in 2401 is received two-hundred years in the past. Thus, the Hegemony of the year 2401 has been aware of current events for 200 years. The Hegemony kept this differential secret from Y’lan, and he only learned of it from the rebelling Faction. We do not know whether he has told the Hegemony that he has found out. He has not told Cross or any other member of Starfleet yet. Stay tuned for future Renaissance episodes, and we’ll tell you more. Biographical data to come soon. Admirals play several major roles in the administration of a fleet of thousands of starships. They control operations of the fleets, assigning missions to the most suitable crews and occasionally executing tactical jobs during conflicts such as the Klingon Civil War. The other most important job is policy; along with the Federation Council, Admirals set the directives and guidelines for Starfleet officers. Some of these are unchanging, such as the long-standing Prime Directive, while others are moulded to fit the times. Several key Admirals are described here. 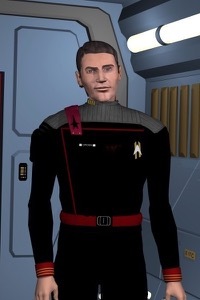 Rear Admiral Henry Portman was a respected member of Starfleet’s top brass and mentor to Captain Cross. Despite the fact that he never achieved a high rank in the admiralty, his influence was strong until late in his career. 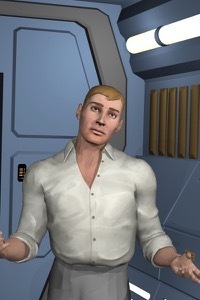 The former commander of Marcus Base and the USS Wellington, of which he often spoke fondly, he entered Starfleet some time before the Dominion War. He continued to maintain his ideals and standards for decades, even when those went out of fashion with his peers. As his power began to wane around the turn of the century, he acted in defiance of his up-and-coming new-school rivals and put protege Neil Cross in command of the Enterprise-G. Although Cross survived the onslaught from unhappy Admirals, Portman did not. In late 2401 he was sent to command Starbase 23, and died soon thereafter when it was destroyed by Reformist forces. His key adversary was Admiral Elizabeth Delfune, a recent addition to the admiralty. With experience in military law, she took it upon herself to get Cross off the Enterprise but failed. 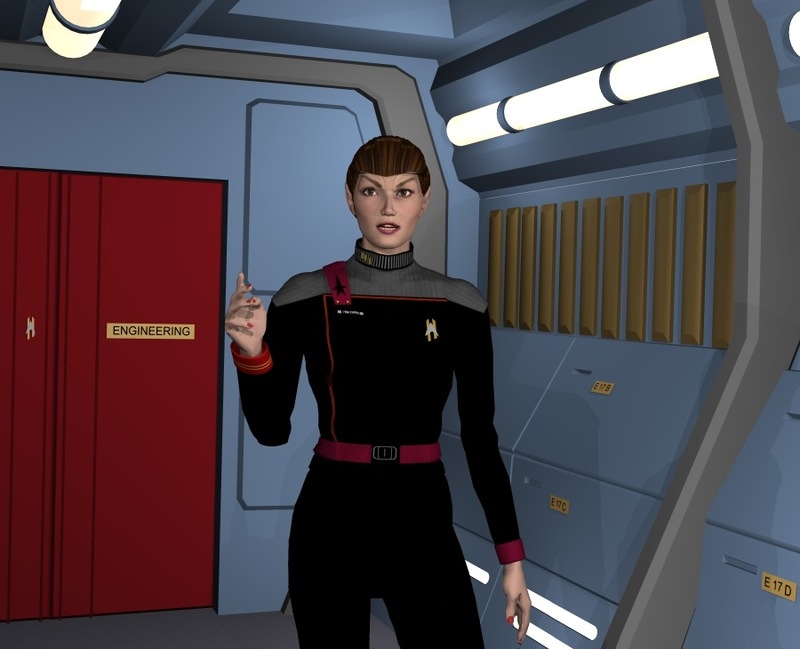 Later, she tried to station a Marine unit on the Enterprise but the measure was defeated by Cross with Portman’s help. She has since been Cross’s opponent at almost every turn, disapproving of his actions which often angered her and many of her peers. Delfune has found many allies among the other young Admirals and is becoming a force to be reckoned with at Starfleet Headquarters. Rumor has it she has a protegé of her own and is waiting for an empty command chair. Another important member of Starfleet Command is Admiral Thel, an Andorian involved with high-security operations. His two encounters with Captain Cross have involved the Trill; the first was when Erik Grey’s shuttle was attacked and the second was when Cross found a destroyed Trill transport. Thel told him both times to stay away from such classified matters, and Cross has obeyed orders so far. 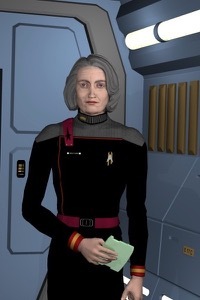 Captain Erika Joel is the commanding officer of the USS Leviathan, currently the only Phoenix-class starship in service other than the Enterprise. She is widely regarded as a capable and confident officer, and she is well-respected by the officers and crewmen who serve under her. 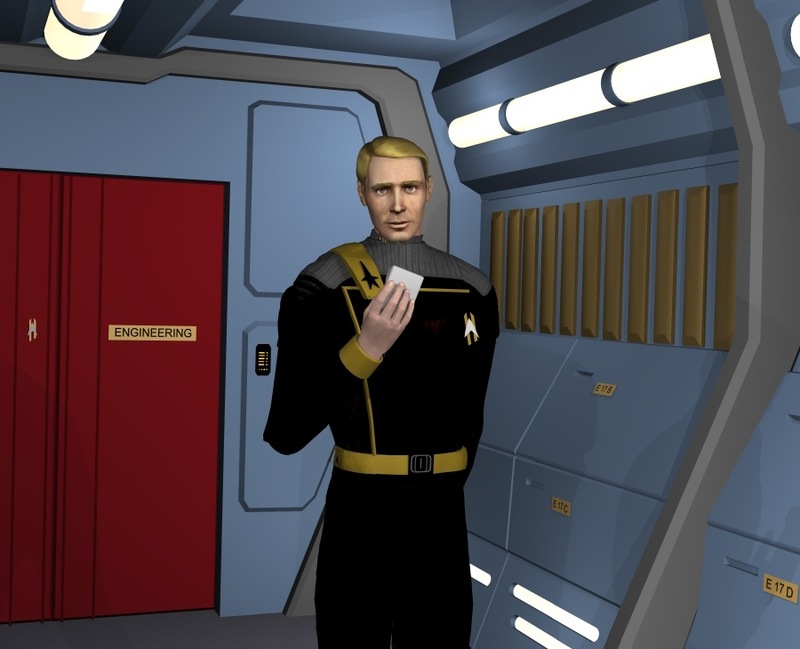 Joel represents the officers of the “new” Starfleet — that is, those officers who are willing to accept the changes that have been made in Starfleet for the greater good of the Federation. There are hundreds of jobs on the starship Enterprise, and they all cannot be done by the six members of the senior staff. Hundreds of junior officers, petty officers, and crew perform the myriad tasks that allow the Enterprise to fly smoothly from mission to mission. The largest sector of crew is the operations department. These are the crew that work in Engineering as well as places such as the cargo bay and the shuttlebay. Though they eventually report to Erik Grey, they may better identify with the Assistant Chief Engineer who oversees the day-to-day happenings in the department. 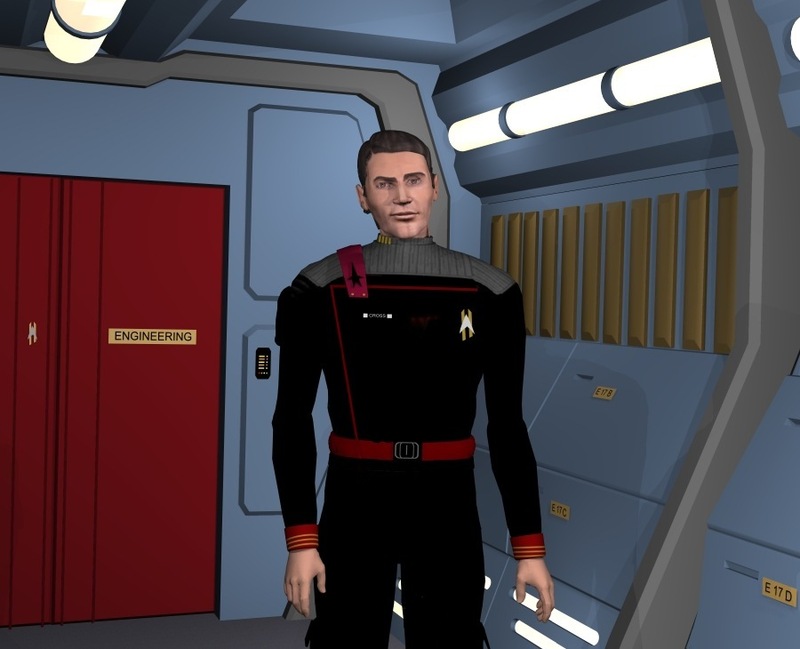 During the Enterprise’s maiden year, this was Lieutenant Robert Kinnan, but upon his departure he was replaced by Lieutenant Sarah Boyle. Both are friendly and outgoing, although Boyle’s promotion was tainted by the fact that she had a fling with Grey. One of the Enterprise’s more exotic crewmembers is Chief Petty Officer Narv Ozran, a Gorn with a Trill symbiont nested in his abdomen. Doubling as a shuttle pilot, Ozran has had a few run-ins with the Trill Symbiosis Commission and one venture into the Mirror Universe. The bridge may fit fewer people, but the officers and crew who work on Deck One of the flagship are the best of the best. Lieutenant Sukothai coordinates ship functions and systems from the Operations station and occasionally assists on away missions. Until Jennifer Quinlan was reinstated, the pilot’s seat was filled by Lieutenant Guer; Guer became First Officer on the USS Corsica. Another critical sector of crew is security, headed by Lieutenant Dojar. 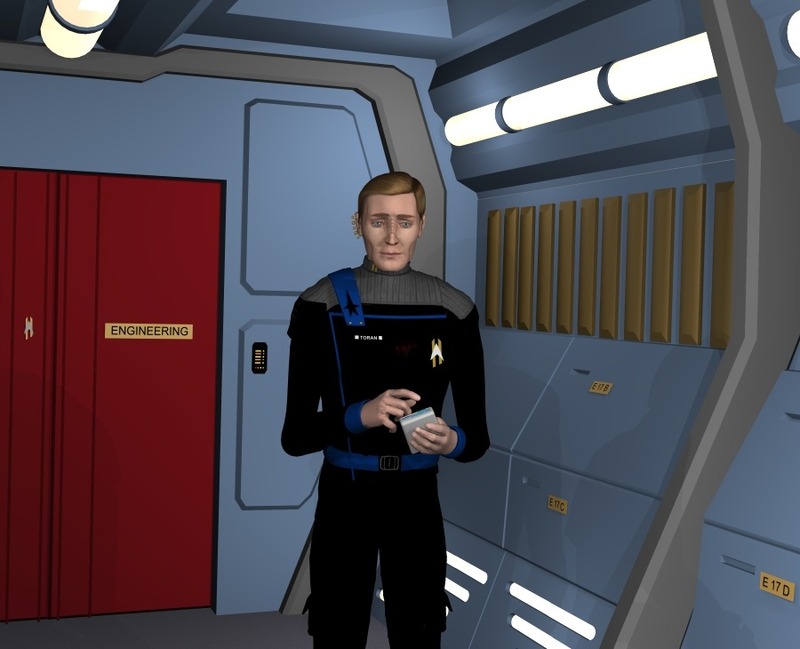 The security staff make sure that the Enterprise’s systems and crew are safe from hostile intruders and also discipline those who are out of line. 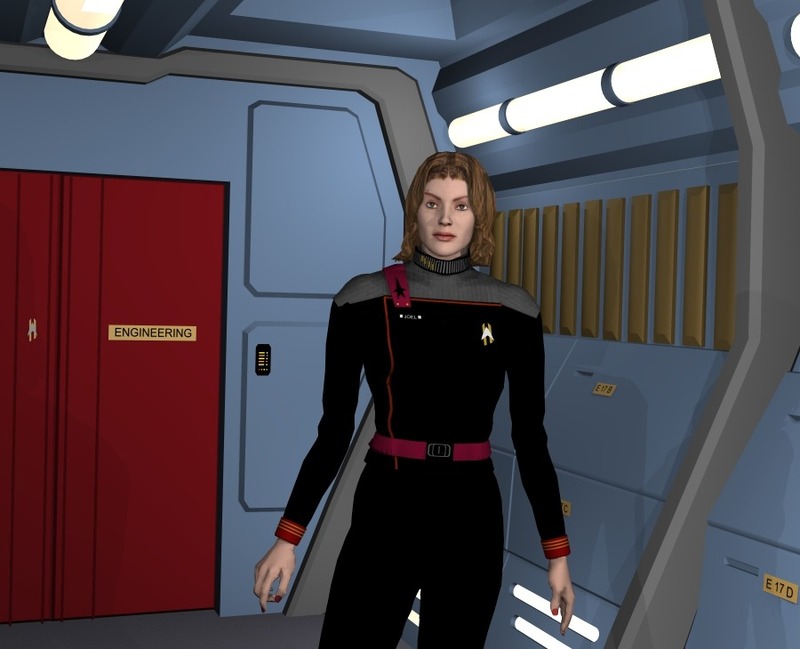 One such person was Jennifer Quinlan, who was thrown in the brig as soon as she first boarded the Enterprise. She has proved to be a problem more than once, such as when she attempted to seduce Ensign Piller. He didn’t prove reliable. Ensigns Joness and Lesmi are two other important security officers who often work together. They worked together when Dojar visited the cloud-covered planet and helped in the investigation into the murdered Trill passengers.